When you make a purchase with the following members of our Green Business Network™ your purchase will support Green America's programs. 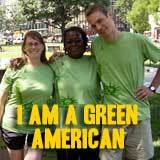 Check out their offers and know that your dollars are supporting both a responsible business and Green America. Whether you decided you want to only use public transportation or it's time to upgrade your old clunker, why not donate your old vehicle to Green America. You'll help the environment and our mission for a green and just world. Plus, it's tax deductible. Whether car, truck, boat, motorcycle, or RV, donate your vehicle today! Discover PureLivingSpace.com, your trusted guide for healthy, non-toxic home and personal care products. Tired of worrying about making the best choices for you and your family? We’ve got you covered. We sell only fully-vetted and certified water filters, air purifiers, organic bedding, and safe personal care and cleaning products. Everything you need for a toxic-free home. Free shipping on orders over $50. Plus, save 10% as a Green America member using discount code PURE. Green America teamed up with Thrive Market to make it even easier to find deep green products from Green America’s certified Green Business Members at a discount. And, when you join Thrive Market, you’ll directly support Green America’s work to create a green economy. Thrive Market is an online community and market that brings you organic, fair trade, vegan, non-GMO products at wholesale prices, saving you 25-50% on natural and healthy products, delivered right to your door.